A Shaman weapon and a Neutral Beast have been revealed. Let's check them out! 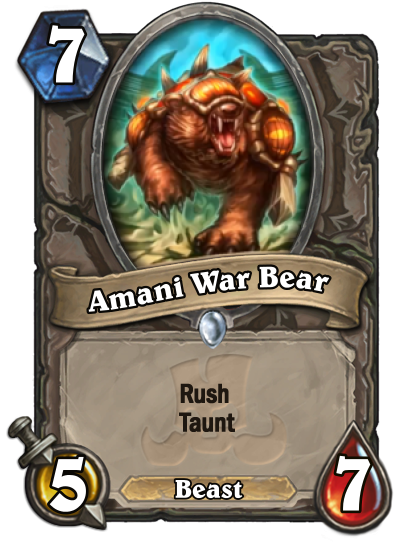 Amani War Bear was revealed by MustPlay. They also unveiled Revenge of the Wild. This looks like a decent pack filler card. It definitely is excellent in Arena. We'll have to see if it survives in Constructed: in the Thai stream it was played along with Revenge of the Wild in a Kathrena deck. If people find ways to Recruit, Resurrect or summon this directly from their hand, it might see Constructed play. Likkim was revealed by Chinese streamer FatCatBall on YouTube. The video has English subtitles. Shaman keeps getting variations of the same weapon. 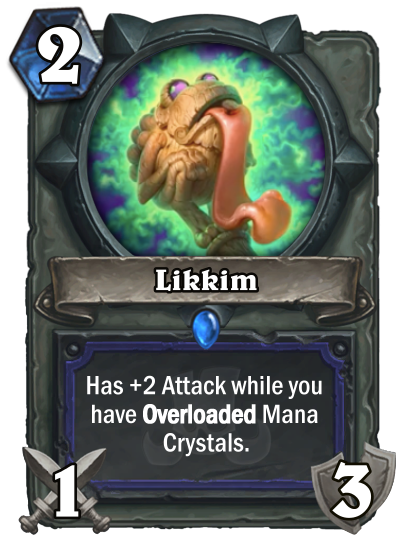 Likkim definitely looks on par with Spirit Claws and Jade Claws. As shown in the video, the +2 Attack lasts for two turns: the turn you Overload and the next turn that your Crystals are still overloaded. The issue is that Overload Shaman, while viable, isn't exactly good either. We'll have to see if any other cards that support this archetype are printed in Rastakhan's Rumble. On a vacuum, though, if you find a way to Overload yourself, this weapon looks quite powerful.